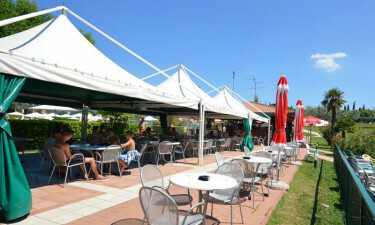 Camping Park delle Rose is a celebrated LUX-Camp that can be found on the edge of Lake Garda. While guests will be treated to stunning ocean views from their mobile home, lush vegetation and forests provide the site with plenty of shade. The site boasts state of the art services and recreational facilities that are ideal for people who demand nothing but the best in life. Luxury camping has never been easier or more enjoyable. 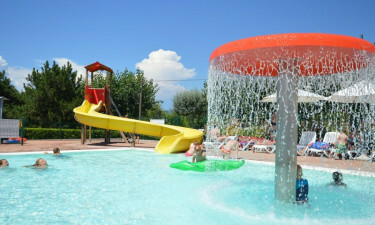 Why choose a camping holiday at Camping Park delle Rose? This luxury camping site features its own water park that boasts a collection of 3 swimming pools, several water slides and a special hydro massage area. There is also plenty of room here to unwind for an hour or two, while the camp staff also organise a wide range of activities for both adults and children in and around the water park. There are plenty of activities for the whole family to take part in at Park delle Rose. Parents can be sure that the children will be supervised while they have fun in the children’s playground, or playing a round or two of miniature golf. This gives parents the freedom to spend time working out in the fitness centre, unwinding at the spa or simply enjoying a little alone time, while the whole family can have fun together at the tennis courts or on the football field. A stunning stretch of sand lines Lake Garda and can be reached on foot from a luxurious mobile home on Camping Park delle Rose, in just a couple of minutes. The waters of Lake Garda are exceptionally clear and guests will be able to cool down by taking a dip here. Boating, fishing and other types of water sports can also be enjoyed on the surface of Lake Garda and aquatic equipment is available to hire from the campsite. Guests never need to venture far in search of something tasty, as the site features its own restaurant that serves up a large selection of classic Italian dishes each and every day. A small kiosk is also set right on the beach, providing sun worshippers with both sweet and savoury treats throughout the day. The poolside bar is a great place to check out for those who really want to experience the decadence of sipping cocktails while working on their tans. The large onsite bazaar is the perfect place to pick up last-minute supplies, provisions to use to create meals for the whole family or even to do a little souvenir shopping. Fresh bread and pastries are available each day, as well as various different types of fresh local produce, such as eggs, milk, cheese, vegetables and the special salami that this region of Italy is famous for.